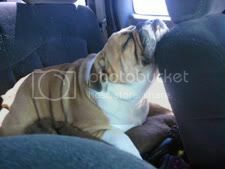 English Bulldog News Forums - February 2012 Zonked Out Bullies Photo Contest Winners! 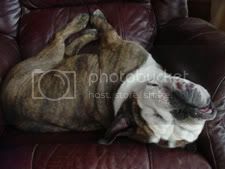 February 2012 Zonked Out Bullies Photo Contest Winners! Congratulations to @Alice Kable for winning the February 2012 Photo of the Month Contest! Congratulations to @boomsboo for being Runner-Up! Congrats Alice and Boomsboo! So very proud, it was such a challenging contest! Congratulations @AliceKable & @boomsboo! Great job - special treats for those two! Everyone's pics were so precious...had me smiling ear to ear! Thx All!!! Super pix... both of them. This was a tough contest to vote on, there were so many great pix. Very tough contest to vote on. I had to ask for help! Super cute! I voted for those two! Congratulations to the winners! And all the other bullie parents who caught their babies in cute sleeping positions....voting was tough! Congrats to the winners, very tough to vote on, all the pics where great. Thank you to those who for voted for us! Tank is very excited he got runner-up! We didn't think we'd get picked because, like everyone else said, there were so many cute pictures! Yay! I love those snoozing bullies! Congrats @Alice Kable in the big win! Congratulations to you both! Love love the zonked out bullies!! Congratulations to the both of you, both pictures are adorabull!!!!! WOW! Thank you so much! Ruggles will be so proud! Congratulations to Tank and @boomsboo! Congratulations to Tank and @boomsboo ! Congrats to you and Ruggles as well!